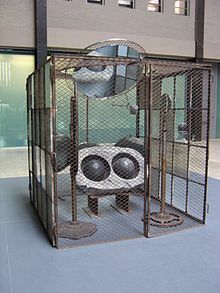 Sculpture by Bourgeois in the Domestic Incidents group exhibit at London's Tate Modern Turbine Hall, 2006. Louise Bourgeois (25 December 1911 – 31 May 2010) was a French-American artist and sculptor. Art is a guaranty of sanity. Also found elsewhere as "Art is a guarantee(sic) of sanity, that is the most important thing I have said." Adrian Searle, "Louise Bourgeois: a web of emotions,"In: The Guardian... June 1 and 12, 2010. At the dinner table when I was very little, I would hear people bickering – the father saying something, the mother choosing to defend herself. To escape the bickering, I started modelling the soft bread with my fingers. With the dough of the French bread – sometimes it was still warm – I would make little figures. And I would line them up on the table and this was really my first sculpture. England is very, very important to me, because in my family the English could do no wrong. When my father picked a mistress, it was always an English girl: if he made her pregnant, she could be shipped back to England and he would not be held responsible. It never happened, but I've made a lot of work called The English Can Do No Wrong. The feminists took me as a role model, as a mother. It bothers me. I am not interested in being a mother. I am still a girl trying to understand myself. I came from a family of repairers. The spider is a repairer. If you bash into the web of a spider, she doesn't get mad. She weaves and repairs it. I became aware of Louise Bourgeois in my first or second year at Brighton Art College. One of my teachers, Stuart Morgan, curated a small retrospective of her work at the Serpentine, and both he and another teacher, Edward Allington, saw something in her, and me, and thought I should be aware of her. I thought the work was wonderful. It was her very early pieces, The Blind Leading the Blind, the wooden pieces and some of the later bronze works. Biographically, I don't really think she has influenced me, but I think there are similarities in our work. We have both used the home as a kind of kick-off point, as the space that starts the thoughts of a body of work. I eventually got to meet Louise in New York, soon after I made House. She asked to see me because she had seen a picture of House in the New York Times while she was ironing it one morning, so she said. She was wonderful and slightly kind of nutty; very interested and eccentric. She drew the whole time; it was very much a salon with me there as her audience, watching her. I remember her remarking that I was shorter than she was. I don't know if this was true but she was commenting on the physicality of making such big work and us being relatively small women. When you meet her you don't know what's true, because she makes things up. She has spun her web and drawn people in, and eaten a few people along the way.